When you think pet rabbit, you probably imagine the fluffy little bunny you got to take care of for a weekend during kindergarten—not one that's the size of a small, carrot-eating toddler. But if you're in the market for a pet that hops like a bunny but steals food off the kitchen table like a puppy, then the Flemish Giant rabbit is the one for you. Here are seven lengthy facts about these special creatures. 1. THEY ARE THE LARGEST RABBIT BREED. The male Flemish Giant can weigh up to 22 pounds and the female can get up to 20 pounds. At most, they grow to be 2.5 feet long. 2. THE MALE AND FEMALE HAVE DIFFERENT HEAD SHAPES. A male rabbit (a.k.a. a buck) has a broader head than a female (doe). The female rabbit has a dewlap—a large flap of skin under her chin—used to keep her offspring warm. 3. THEY COME IN SEVEN COLORS. The National Federation of Flemish Giant Rabbit Breeders recognizes Black, Blue, Fawn, Light Gray, Steel Gray, Sandy, and White as the official color varieties. In 1916, only Light Grays, Steels, and Blacks were recognized. Blues and Whites were accepted in 1919, Sandy in 1924, and Fawn in 1938. 4. 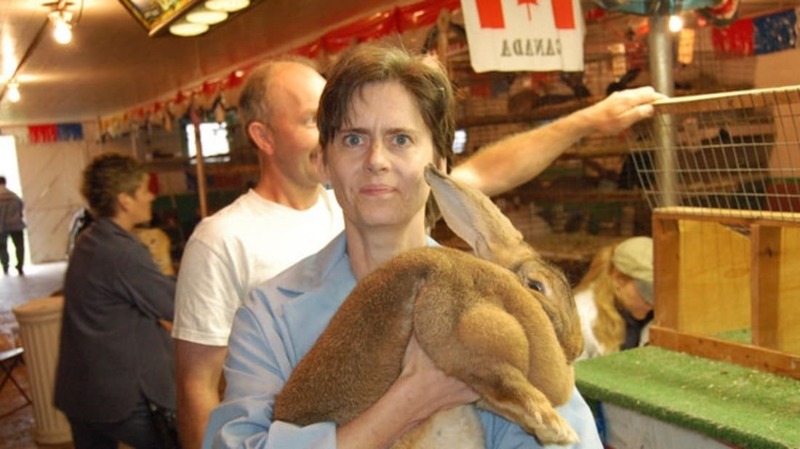 THERE IS A NATIONAL FEDERATION OF FLEMISH GIANT RABBIT BREEDERS. The Federation was founded in 1915 by a group of four Flemish Giant rabbit breeders. This year, they celebrate the 100th anniversary of the Flemish Giant National Show. At shows, rabbits are posed in specific ways so judges can examine their bodies and teeth. To be eligible to compete, the rabbit must be one of the seven recognized colors and be entered into the correct age class. "The American Rabbit Breeders Association Standard of Perfection" dictates that a rabbit under six months and at least 6.5 pounds is eligible for entry in the Junior class, one between six and eight months is considered Intermediate, and eight months and older must be entered as a Senior. 5. THEY WERE ORIGINALLY BRED FOR THEIR FUR AND MEAT. Flemish Giants are still used for meat (especially in stews), but their large bone structure and expensive diet means you’re not getting much bang for your buck. Now, they’re mostly bred for show or as pets due to their docile nature and 8 to 10 year life span. 6. THE NEW YORK DAILY NEWS ONCE "INTERVIEWED" A FLEMISH GIANT. In 2010, the paper ran an "interview" with Herbie, Prospect Park Zoo’s 18-pound rabbit, to promote the zoo’s Live Encounters Program. It was actually an interview with Denise McClean, the zoo’s director [PDF]. McClean revealed that Herbie was domestic and "probably would not be able to survive out in the wild on my own." In response to the question "Do you ever misbehave?" she said, "Flemish Giant rabbits have litters that run from five to 12 bunnies. If you left me with a female, you could end up with a whole lot of rabbits." 7. THEIR ORIGINS ARE HIGHLY CONTESTED AMONG FLEMISH GIANT RABBIT HISTORIANS. However, authorities seem to agree that they were bred in 16th century Belgium. The first authentic record of their existence dates back to 1860's England when, according to Thomas Coatoam's "Origins of the Flemish Giants" published in the 1983 edition of the National Federation of Flemish Rabbit Breeders Guide Book, travelers returning from Flanders told tales of large rabbits. In 1890, they crossed the big pond and came to the United States.